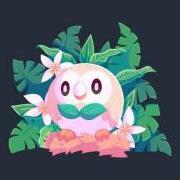 Leader has full control of the Raiding schedule, does his best to accommodate folks and both raid groups may go over 2.5 hours long if everyone wants to keep up the fight that night. 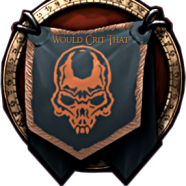 Horde All Purpose Guild created June 2015 by Lovithla, a long time player that enjoys all the aspects of the game - offering a taste of everything the game offers with no obligation from members to attend events created or meet game activity requirements. We get that this is just a game to have fun playing and people have actual lives. We are VERY helpful with a quirky sense of humor, laugh at inappropriate as long its not to deliberately hurt a players feelings, appreciate alt-aholics, love achievements, offer month events with prizes at no obligation to attend. Most members are 18+ our humor and topics are very adult . TO JOIN: Just "LIKE" our Face Book page [would crit that] and leave a message/post that you want to join and Sirona or Lovithla will reach our to you. Gaming: PVP / RP / Achivements / Questing / Dungeons / Instances / Mount farming / old Raids and new. NOTE: We offer Free Guild Vent - And gift 1 member a month a free BattleNet game card ! 1 RESPECT-ful to all Guild members. for services / assistance / materials / anything… if you want to make cash off of people that are in a bind~ find a victim outside of your guild family. 3 Joking Teasing Acting stupid ...all encouraged! - BUT not when deliberately trying to hurt someones feelings or game play. when you rage out / hold back heals / tank with no regard to your party ~ people remember that they won't join your guild, pick you for pre-made groups, pick you for raids or co-guild with us on Raids... cuz your a tool. So represent with pride don't be a tool. 5 If the boss isn’t killed - your dps / damage / heals don’t matter. Don’t put your recount % above your team or mechanics. Wipes cost money in repairs, learn your class or ask for help. 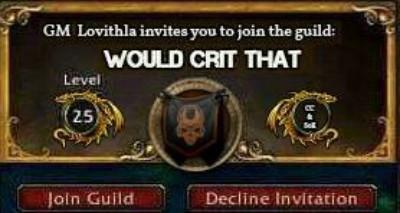 6 If you see a player without a guild mention us. 8. Please participate, even if it is just in chat. Active members make a Guild- build Guild Achievements and open up Guild rewards Guilds die a slow death when no one talks/helps. 9. Know that if the GM sees or hears you being a massive tool or causing lame drama to guild members (regardless your rank or theirs) the hammer will will drop. Kristi no likes azz hats, so don't be one please-Skip the barracks go straight to banned….along with all your Alts.